To achieve blob tracking i first recommend you perform a few tutorials to make sure you can get used to the vvvv environment. Follow the links below and the first two (short) vvvv tutorials before continuing. The vvvv Tutorial Introduction and the Hello World Tutorial will teach you most of the basic skills you need for using vvvv. Once you’ve run those two tutorials, you have one last step before experiencing multitouch magic! It’s time to check that your webcam is working with vvvv.You can test whether or not vvvv automatically detects your webcam using the vvvv VideoIn Tutorial. This tutorial comes with instructions on how to test your webcam in vvvv: follow these instructions! Before going on to the final step, use the VideoIn Tutorial to make sure that you are getting images and that your camera is generally working with vvvv properly. If your camera is not working with vvvv, go to the vvvv forums and seek help with setup and configuration. If you have gotten this far, you finally have all of the pieces working, built, and installed: it’s time for multitouch interactions. Download the v4_blob_detection.v4p file located below to your desktop and run just by clicking on it. In v4_blob_detection, like in VideoIn Tutorial, just connect the VideoOut of the contour to either VideoOut or VideoTexture block to run the program. 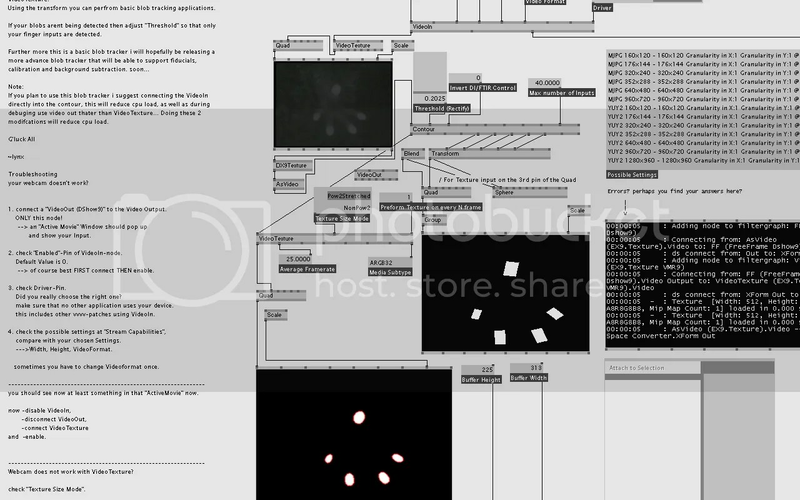 After connecting the pins, you should see 3 displays display windows in the vvvv user interface: the first window will display the live feed of the i.e. the dvslcapture0, the second will display the infrared ‘blobs’ that are emitted when you put pressure on the touchsurface, either in the VideoOut Active window or the Renderer depending on how you have connected your pins and the other window shows a video feed, where each blob has been replaced by a rectangle. You may want to start play around with vvvv and your setup. My screens is different with your example. First screen show me just vedio webcam screen. Second screen show me much larger squares. Third screen is show me vedio webcam screen made of white and black. How should I going to solve these problems.